Hiring an agency to manage Bing Ads campaigns can be a smart decision. It saves you time, lets you focus on your core business, and leverages outside expertise. 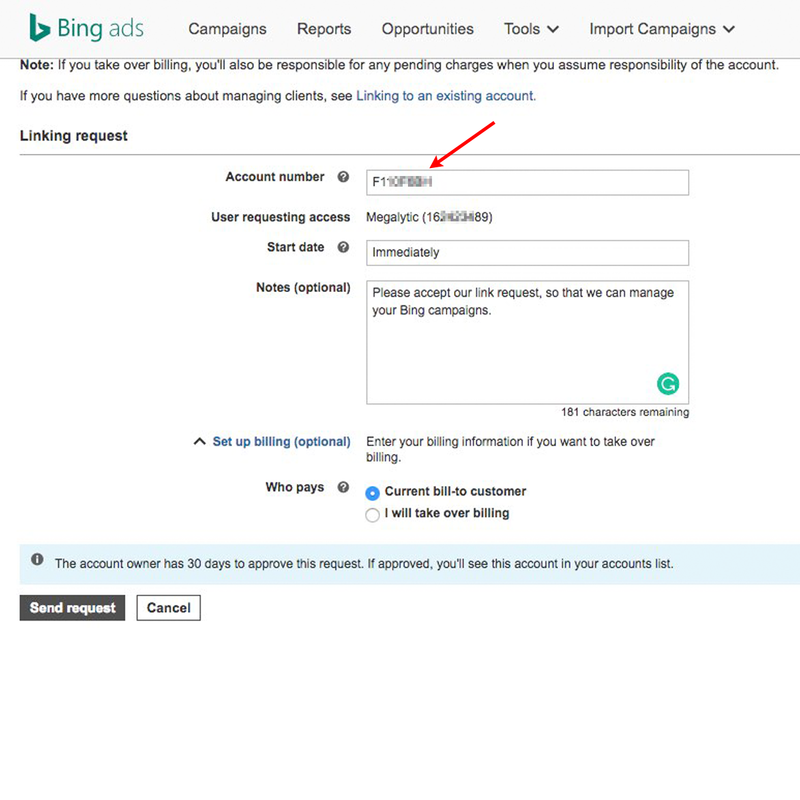 Often the first step when you hire an agency, is to give them access to your Bing Ads account so that they can create, edit, and track campaigns for you. Furthermore, when the client relationship ends, you should remove the agency's access to your account. In the terminology used by Bing, your agency is going to link (unlink) with your account. The linking process is quite simple. Here are the steps. Log in to your Bing Ads account and find your account number in the upper left corner along with the account name. Copy that number and email it to your agency. They will use this number to send you an invitation to grant them access to your account. The next few steps are up to your agency. 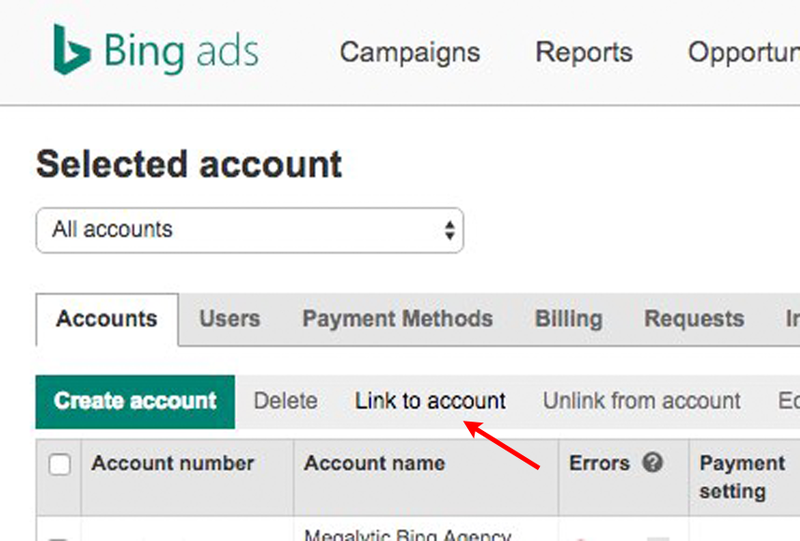 Once they receive your account number, your agency can send you a request to link to your Bing Ads account. To do this, they log in to their agency account, select the "Accounts" tab, and click on "Link to account". Clicking on "Link to account" opens a "Linking request" form in your agency's account where they enter your account number. 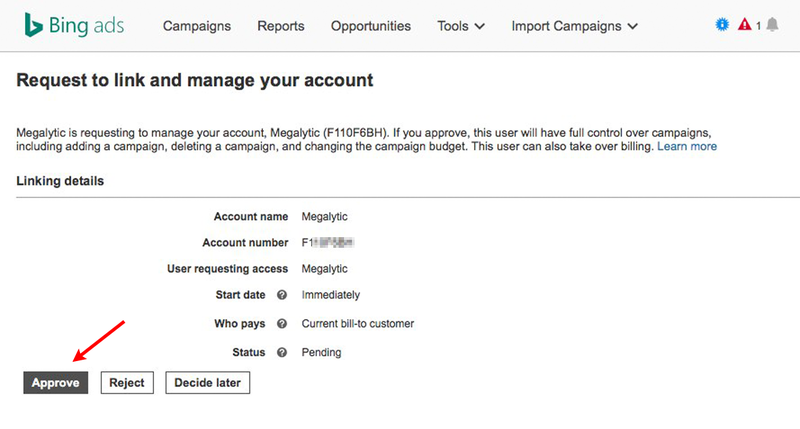 If your agency will be paying for your ads and billing you back, they will click the button to "take over billing". However, if you will continue paying the Bing Ads bills directly, then they will leave the button "Current bill-to customer" selected. 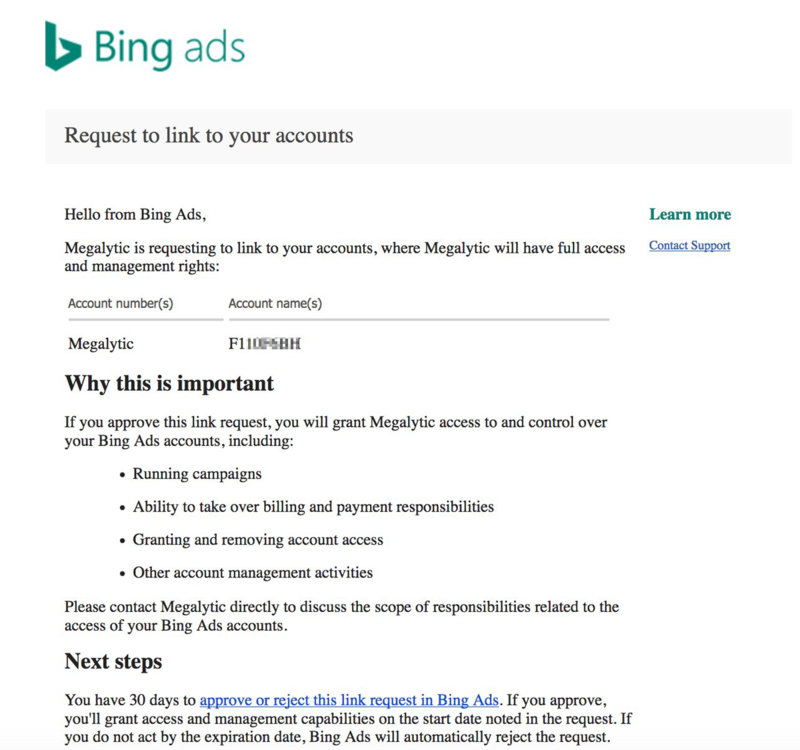 When your agency clicks "Send request", Bing Ads generates and sends an email to you with that requests permission to link with your account This puts the ball back in your court, as your account is not linked with your agency until you accept the invitation. To complete the process, you need to accept your agency's invitation. Of course, you can also reject the invitation if you decide that you do not want them to access your Bing Ads account. Log in to your Bing Ads account, and you will notice that there is an alert labeled "Account link request". Click on the alert and an approval page will open. Alternatively, if you don't see the alert, you can open the “Accounts Billing” menu (by clicking on the gear symbol in the header), and click on the “Requests” menu item. Click on the "Approve" button to complete the linking process.